Elephant Rock Books. 2013. 220 pages. To summarize the plot of Jacob M. Appel’s second novel, The Biology of Luck, is difficult, in large part because while there is the arc of a story within it, that arc is danced around and played upon by such a wild menagerie of characters and events that it’s sometimes hard to see clearly. And yet that’s a part of this book’s strange genius–each chapter stands nearly on its own, and yet leads somehow inevitably into each subsequent series of events. Each chapter, too, is populated with a broad and exceptionally well-rendered cast of characters who are, at times, falling into rivers and catching on fire, swindling bank tellers and absconding from stalkers, inventing the perfect sentence or determining each other’s biologically-determined fate. He sits in the forenoon sun, eyes closed but not sleeping, absorbing his beauty rays with a silver reflector, so that if his aluminum lawn chair weren’t planted on the Fillmore Avenue sidewalk, if his Hawaiian shirt weren’t clipped at the top with a bolo tie, if the shades resting in his tight-cropped hair didn’t boast a bridge of custom-made gold leaf, in short, if he were not Bone, but just another olive-skinned cripple at the curbside, you might make the gross mistake of feeling sorry for him. What ties these people and their lives together is that, as in Joyce’s Ulysses, the entire story takes place in the course of a single day–a Wednesday in summer–and all within a single city–New York. Our Mr. Bloom, however, isn’t a Leopold but a Larry, who works as a tour guide and who, on this particular day, is leading a group of Dutch tourists through the city their ancestors colonized some four centuries before. If Larry Bloom is our protagonist, then Larry’s protagonist is Starshine Hart, the woman of his dreams, the woman he barely even knows but about whom he’s obsessed to the extent of writing a novel about her life as he imagines it. 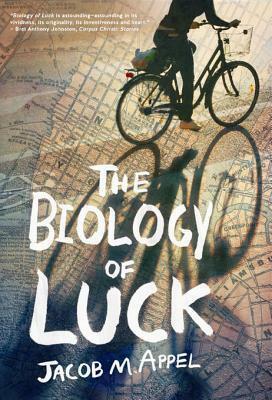 Larry’s novel, too, is called The Biology of Luck, which makes a reader wonder where he or she might fit in to all of this. Are we also inventing a life for the author of this work? And how deep does this hall of mirrors go? Appel has written a novel not so much within-a-novel like a nesting doll, but rather as a novel interlaced within another, and one in which we might find ourselves lost as well. By turns we encounter chapters following segments of Larry’s day and then segments following Starshine’s, and in the end, the story and the day both culminate in a date with Starshine and Larry at which Larry hopes to win her heart with his status as a soon-to-be-famous writer. Whether he succeeds, however, must remain up to the reader. Regardless, the book seems to examine the nature of fiction itself and the role that imagination plays in both the minds of the author and the reader, since reading, too, is an imaginative process. Though The Biology of Luck is only his second novel, Appel’s status as a prolific writer is well-cemented. He’s published over two hundred articles and stories about both literature and bioethics. He works as a psychiatrist in New York as well, where, per the book jacket, he’s also a licensed sightseeing guide who lives in Manhattan. Larry Bloom’s résumé is hardly so robust, but the nature of this book leaves one wondering just how much of it comes from experience and how much is invented. And perhaps that’s just the point. WILL DONNELLY is a Ph.D. candidate in literature and creative writing at the University of Houston. He is a graduate of the Iowa Writers' Workshop, and his fiction, non-fiction, and reviews have appeared or are forthcoming in Hobart, Pebble Lake Review, The Potomac Review, Fiction Southeast, Gulf Coast, and elsewhere.